When are we going to eat? Why do you have cups on your heads? 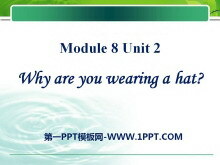 Why are you wearing a hat? 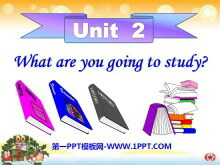 《What are you going to study?》PPT课件3 be am going to+动词原形 is are 用来表示按计划或要发生的动作，有准备；打算的意思。 I 用am;复数 （we they you 两人以上）都用are；第三人称单数（she he it人名)都用is wil..
《What are you going to study?》PPT课件2 学习目标： 1.学习语句： What are you going to study? 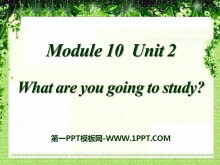 Im going to study Science 2. 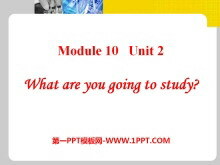 识别单词：history geography physics chemistry politics ... ... ... Are you going to go ..
《What are you going to study?》PPT课件 1.I'm going to study HistoryScience and ChemistryMaths and Geographyand learn with my new friends happily! 2.Are you going to go to middle school in September? 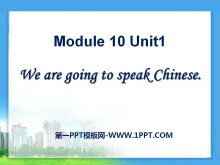 3.Im going..
《We are going to speak Chinese》PPT课件5 物理 Physics 化学 Chemistry 历史 History 九月 september 兴奋的 excited Questions (1) What subjects is Daming going to study? (2) Where are Sam and Amy going to go? 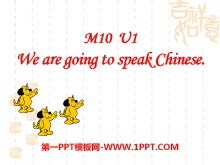 (3) ..
《We are going to speak Chinese》PPT课件4 What are you going to do? Im going to dance have a picnic watch TV listen to music Answer the questions: 1. Is Daming going to go to middle school? Yeshe is. 2. 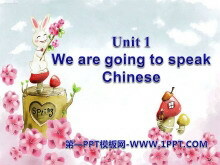 What la..
《We are going to speak Chinese》PPT课件3 We just had the Spring Festival. 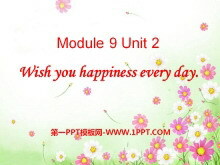 我们刚过完了春节。 What did you do during the Spring Festival? 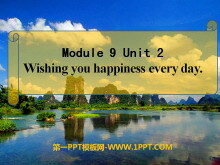 你们在春节期间做了什么呢？ Did you celebrate(庆祝) the Spring Festival? 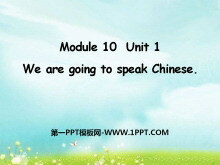 ..
《We are going to speak Chinese》PPT课件2 study kindergarten primary school middle school 学习 幼儿园 小学 中学 A: Are you going to go to this September? B: Yes Im really excited. A: Ill miss you. B: Ill miss y..
《We are going to speak Chinese》PPT课件 What are you going to do? You can use: 1. have a picnic 2. listen to music 3. watch TV 4. dance Hello I am Tom. I am going to go to middle school. Im going to speak Chin..
《Wishing you happiness every day》PPT课件4 What is Lingling doing？ She is writing goodbye letters to all her friends at school. What does she write first？ First she writes a name of a friend. 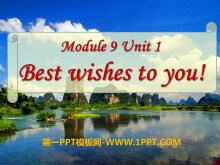 How many letter..
《Best Wishes to you》PPT课件3 教学目标 1.能够听、说、读、写单词：wishnearlyendprimarymessagekeepfuturehappinesswhat. 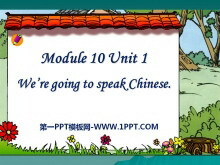 2.理解并运用短语：best wishessay good bye toprimary schoolgood luckgood ideaon the earthfor ..
《Why are you wearing a hat?》PPT课件3 Review cup [kp]杯子 planned [plnd]计划（plan的过去式） baseball [besbl] 棒球 more [m]更强烈的 smile [smal] 微笑 mistake [mstek] 错误 with [w] 与。。。有关 said [ sed] ..